Plate fifteen from 'Picturesque Scenery in the Kingdom of Mysore' by James Hunter (d.1792). 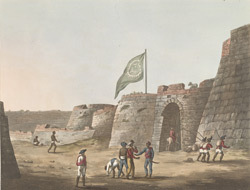 This aquatint, which is based on an original composition by Hunter, shows the north gate of the fort at Bangalore, Karnataka. Tipu Sultan's flag is seen waving above the gate. Very little of the original fort, which was rebuilt out of cut stone in in 1761, remains today. The fort was oval in shape, and measured 731 metres from north to south, and 548 metres from east to west. Haidar Ali (c.1722 - 1782) and his eldest son, Tipu Sultan (1753 -1799) were the kings of Mysore during the Eighteenth Century, and made Bangalore into one of their strategic capitals.